While Kara was whisked away to her Grecian getaway, I drove up scenic Route 89 to the diverse and epicurean city of Montreal, Canada. I spent the weekend strolling from neighborhood to neighborhood sampling a mix of traditional Quebecois cuisine and some unique spins. Upon arriving, my friend and I walked through the city’s Little Burgundy neighborhood, lined with intimate dimly lit eateries with charming outdoor terraces. 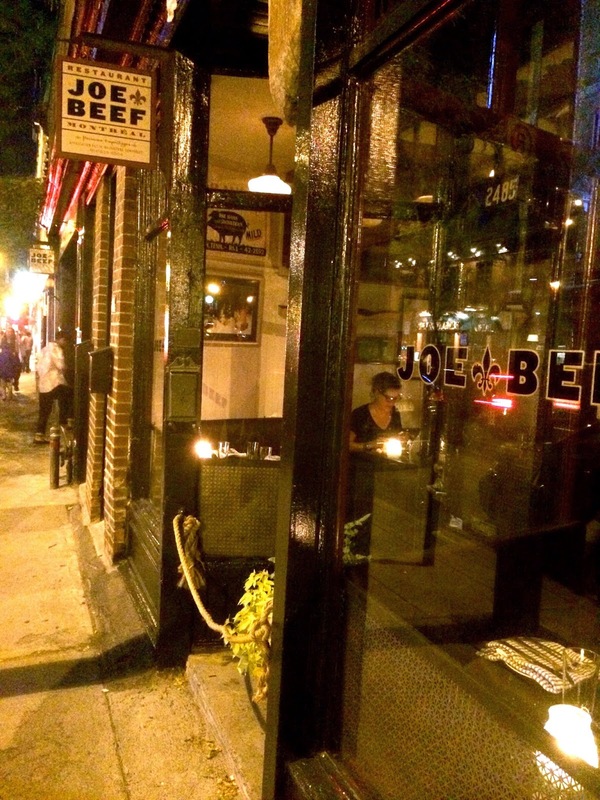 We had made dinner reservations at the highly anticipated, Joe Beef (made famous as Anthony Bordain’s favorite spot). Upon walking into the cozy, candlelit restaurant with Beck’s Morning Phase and the Black Keys playing, I instantly felt relaxed and ready to delve in. The ever changing menu transcribed on a blackboard featured fun and out-there dishes like a Foi Gras Doubledown, horse tartare, and Spaghetti Homard-Lobster. Our charming, tattooed waitress further explained the menu and suggested dishes based upon our mood that evening. 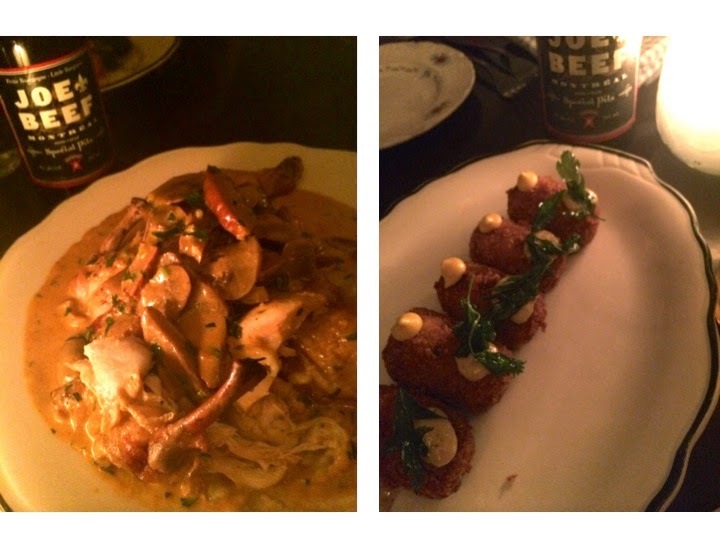 I ordered a Joe Beef Special Pils to start with a plate of fried cured meat and cheese nuggets with mustard and Thousand Island, followed by a rich, roasted Cornish Game Hen in a pool of creamy lobster mushroom broth. 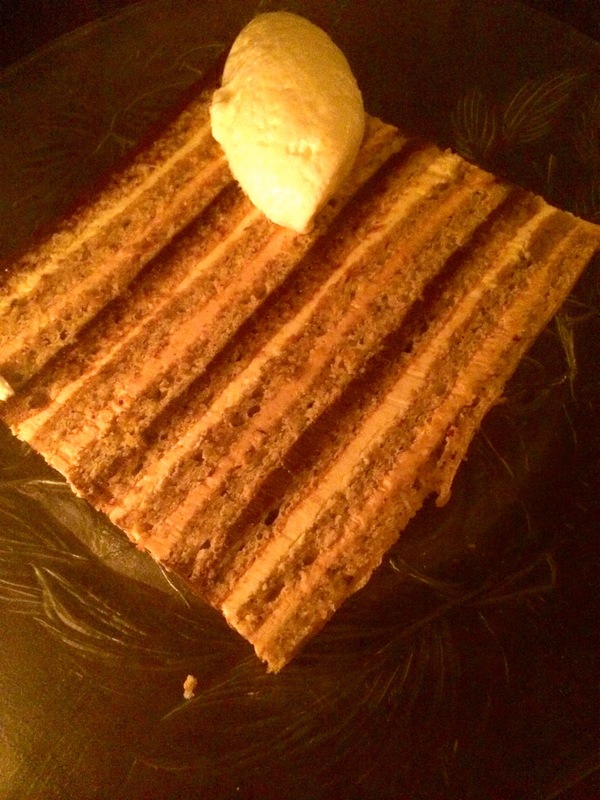 Our lovely waitress encouraged us to order a slice of Marjolaine for dessert which was not only a work of art but a mastery of layered chocolate and hazelnut. Still on a high from dinner the evening before, we woke up the next morning and walked up to Mount Royal Park. The lush, expansive park on the highest point of the city was landscaped by Frederick Law Olmsted (the designer of New York’s Central Park). We mosied our way up amid tourists and locals. On our way back down to the city, we popped into a patisserie for a freshly baked croissant and cup of cafe au lait. While traveling, I always seek out the local markets and tap into the art scene. We found a sprawling farmer’s market, the Jean-Talon Market, overflowing with fresh fruits, vegetables, Montreal-famed cured meats, an abundance of all that is maple, and an assortment of locally prepared foods. We continued towards the Esplanade Clark, where we stumbled upon the The Fountain House, a public installation by raumlaborberlin, conceptualized and created as a spot to gather and appreciate art in nature. 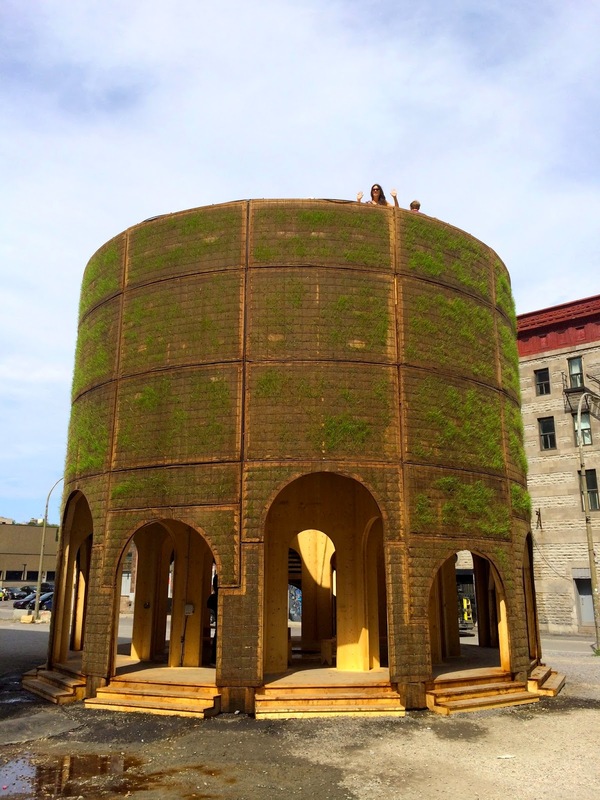 The natural grassy exterior was juxtaposed with the industrial setting behind it. I, of course wasted no time running to the top. 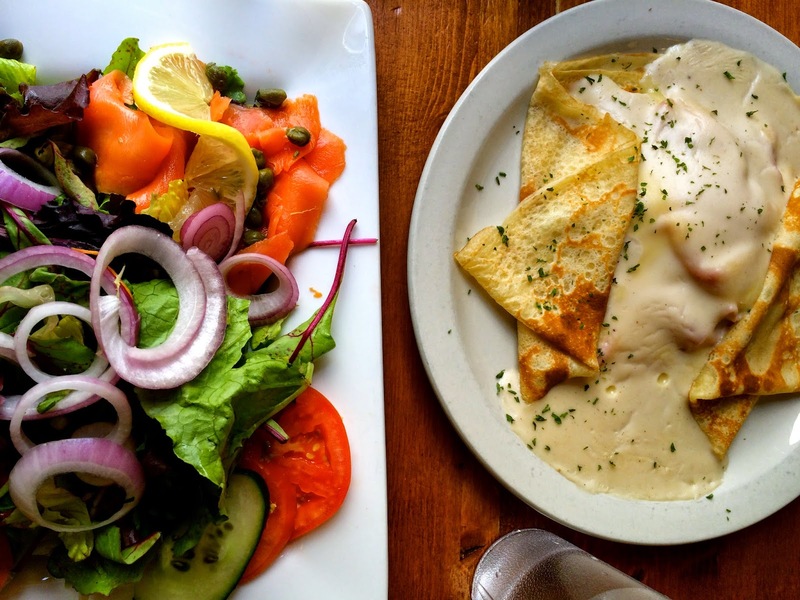 After soaking in some culture, we walked through Old Town and enjoyed a late lunch at a local brasserie with ham and cheese crepes topped with a rich Bechamel sauce, and a green salad topped with smoked salmon roulades. A highlight of the trip took place that evening as we ventured across the Saint Lawrence River to Arcade Fire’s final show of their Reflektor tour in Parc Jean-Drapeau. Amid the masquerade masked concert-goers, we enjoyed rum cocktails served in cute plastic cups with straws, and sampled another traditional dish, poutine (gooey gravy-covered potato fries). 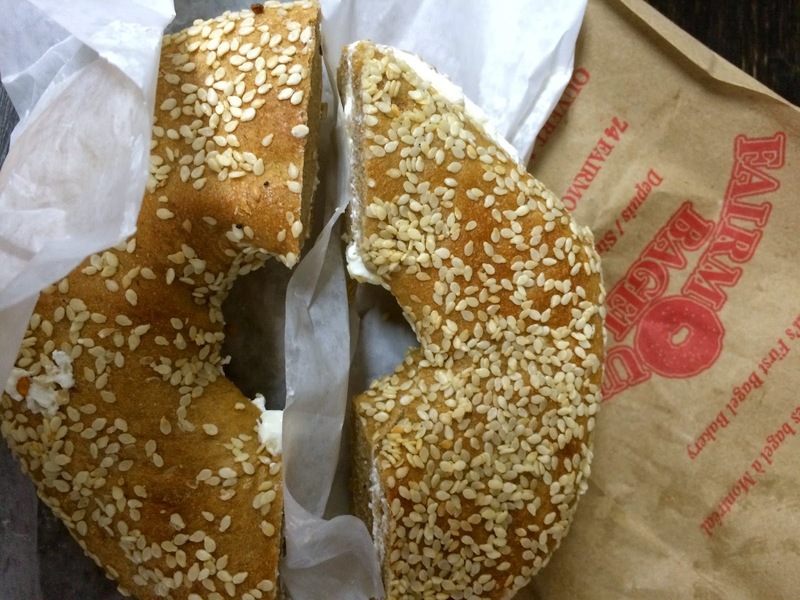 The next morning, we drove to Fairmount Bagel located in a quiet, residential neighborhood. 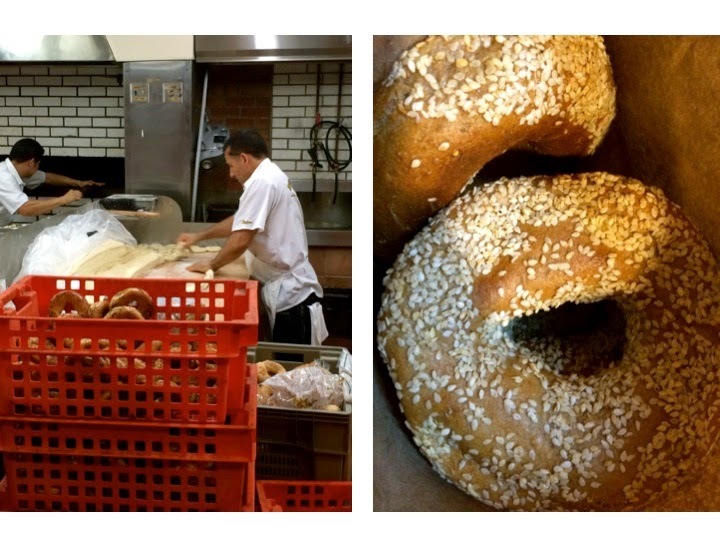 The tiny bagel shop is open 24/7, has no tables or chairs, and sells all kinds of hand rolled bagels that are boiled in honey water and cooked in a wood fired oven. I instantly bought a sesame seed one slathered with cream cheese (that did not make it to the car), as well as a dozen to bring back to the states. It was the perfect way to ending to a European weekend getaway - within driving distance!